HellermannTyton provides contractors with specialized training to ensure reliable and professional installation of our products to meet warranty specifications. HellermannTyton Certified Installers are the essential link between HellermannTyton connectivity products and the design, installation, testing and maintenance of a structured cabling system. Only HellermannTyton Certified Installers from approved Certified Contractor companies can provide the 25-Year Network Sciences System Warranty, guaranteeing their work and installed HellermannTyton products. Installers/contractors must complete fiber and copper training and receive certification to provide each warranty. Each course is designed to teach proper installation of a structured cabling system that complies with the latest TIA standards, and each course is recognized by BICSI for continuing education credits (CECs). Courses feature hands-on training and testing. Attendees receive a documentation packet including course text and notes, copies of the presentation, certification and more. This course covers copper structured cabling systems, including cabling standards, cabling practices, testing practices and termination practices. This course includes hands-on termination activities. Learn about the basics of fiber optic technology and installation. This course covers ANSI/TIA-606-B regarding labeling in the data center. Understand the new requirements as well as best practices for easy implementation and maintenance. Participants will learn the basic principles and requirements, with time for questions and discussion. Labeling examples are reviewed. 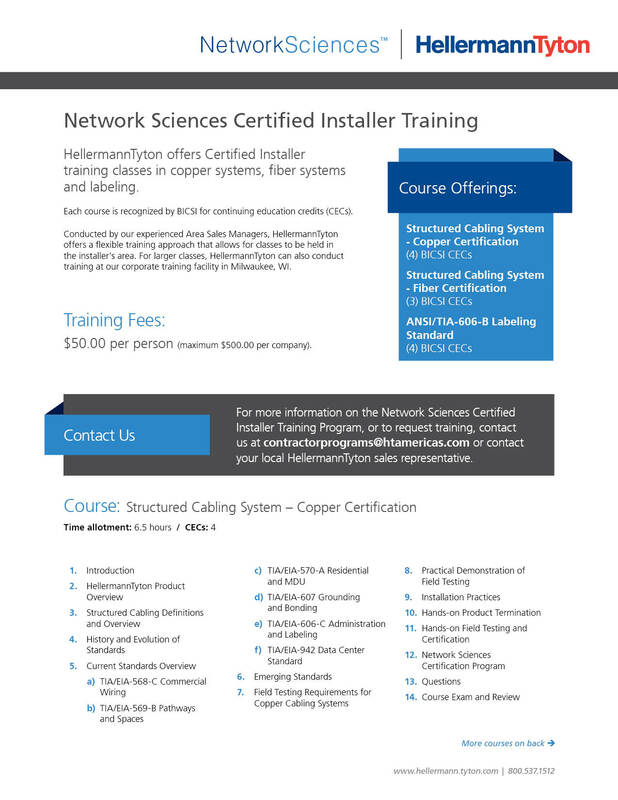 To find out more about HellermannTyton Network Sciences training and Certified Contractor programs, contact us at [email protected]. This fast-paced, two-day training session teaches attendees how to operate, assemble, disassemble and troubleshoot HellermannTyton automatic cable tie tools and accessories. The course goes over each part of the HellermannTyton auto tools in extensive detail. Attendees learn ways to increase productivity through proper use, maintenance and repair. Those who complete the course receive a certificate from HellermannTyton. For more information on automatic cable tie tool systems training, please contact HellermannTyton's tool systems department at [email protected].